Maidens’ Brooklyn Olson lines up her putt. Chiefs’ Fisher Niemeyer hits his fairway shot on the ninth hole. 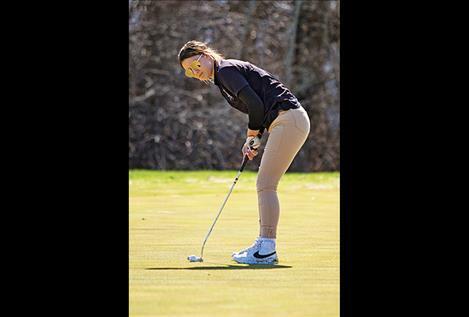 RONAN – Both the Chiefs and Maidens finished first at the Mission Mountain Golf Club during the Ronan Invitational April 11, beating out 12 other schools with a team score of 331 and 475. Chiefs’ Vinny Bird Webster and James Farmer tied for third with scores of 78 and Brooklyn Olson shot the lowest total for the Maidens with a 99, good for fourth place. 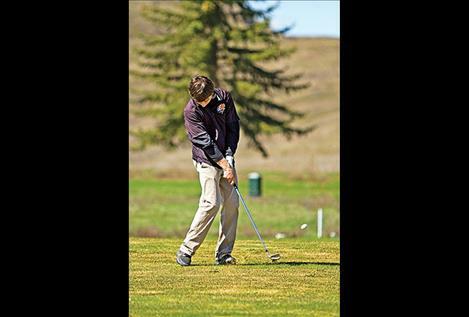 On Thursday, the Ronan Chiefs won the boys team title during the Steve Hullett Memorial at Eagle Bend in Bigfork. “Our boys team has depth and skill. If we keep improving, we have an opportunity to be the best boys team Ronan has ever had,” Olson said. Anthony Camel shot a sixth place 85, while teammates Bird Webster shot an 88 and Farmer shot an 89 to round out the top ten. Olson shot a fifth place 91 for the Maidens. Team results – 1. Ronan 331; 2, Thompson Falls 353; 3, Loyola Sacred Heart 372; 4, Libby 382; 5, Anaconda 404; 6, Florence 425; 7, Eureka 451. Individual results - 1. Ryggs Johnston, LIB, 72; T3. Vinny Bird Webster, Ron, 78; T3. James Farmer, RON, 78; T8. Fisher Niemeyer, RON, 86. Team results – 1, Ronan 475; 2, Florence 512. Individual results - 1. Kylie Esh, LOY, 73; T4. Brooklyn Olson, RON, 99. Team results - 1. Loyola 376, 2. Thompson Falls 445, 3. Bigfork 476, 4. Florence 489. Individual results - 1. Kylie Esh, LOY, 77; 5. Brooklyn Olson, Ronan, 91.